A serious attempt at democracy, in the sense of being able to influence the decisions that affect our lives, can only be done through solidarity with those in the European Union. Interview. 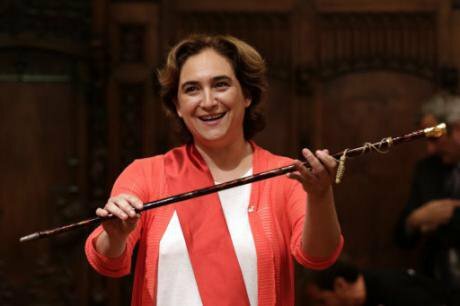 Ada Colau, leader of leftist coalition Barcelona Together, holds her baton, having been elected Barcelona's new mayor, Spain, June, 2015. Emilio Morenatti / Press Association. All rights reserved.Rosemary Bechler(RB): We were lucky enough to catch your contribution to the BREXIT debate in a meeting at the TUC and more recently in the DiEM25 launch panel discussion at the LSE – as a long-standing contributor to openDemocracy on European matters, what do you feel your role should be in this national debate? Mary Kaldor(MK): I suppose what I think is that the dominant debate is a very Establishment debate. Both the people who want Brexit and the people who want to stay in are making very conservative arguments. Michael Chessum had a nice piece in openDemocracy making that point. I feel that there is a really important, progressive, emancipatory case for Europe that is not being made in the mainstream debate. That, I feel, is what it is most important to do. And the problem is that the left are very ambivalent about the European Union because it is so neoliberal, and so what we need is to put together a really enthusiastic left case for the European Union. RB: But can we only really do that by talking about Another Europe being possible? MK: Yes, though I think we have to understand that the existing European Union is a funny mixture. That was the argument you heard me put at the TUC, and it is evident, for example, in relation to security. The European Union was established as a peace project. For the first twenty years of its existence it did emphasis social justice. It was brought together through economic cooperation, and that involved the agricultural policy – which is actually a social policy for farmers – the regional funds, which was really a social support for poorer regions, and so forth. The turning point was in 1991 with the Maastricht Treaty, which I think was a compromise between the passionate Europeans represented in those days by Jacques Delors, and Margaret Thatcher! It was actually us Brits who brought neoliberalism into the European Union in a big way! And in fact if we were to leave the European Union, I think we would be even more neoliberal in our orientation. That is why you have got all the hedge funds arguing like mad for Brexit, because they think they can have even less regulation outside the European Union. RB: And it’s why some Europeans are begging us to go? MK: Yes, some Europeans do think that Europe will be less neoliberal without us. But there are still very important constructive elements in the European Union not taken into account in these monotone visions. The European Union is a very different kind of animal from the nation state. The nation state was founded on war, and has this sort of deep state at its heart, based on the military-industrial complex and intelligence services and all of these things - whereas the European Union is more like the United Nations, built on the idea that its objective was to bring peace, even if its methods were economic and social. And so it operates in a different way, and you see that in the security field, in the climate change field. Also what I think is very interesting about the European Union is that it is much more open to civil society pressure, to ngo pressure than nation states are. In an odd way, we in the ‘democratic’ nation states have formal democracy – but a formal democracy that becomes a kind of armour that protects the deep state, because formal democracy always produces these terrible Establishment politicians. Whereas inside the European Union you have much more of a deliberative process, and they are really seriously discussing a Tobin tax, a tax on multinationals, on safe havens, and particularly in my field, security, the role of the EU is much more to do with peace and justice, and intervening in conflicts in a different way, even if they don’t get it right! It’s not a traditional defence policy by any means. And if that could be given more teeth it could be really important actually. RB: Not surprisingly, this is not the EU we hear about in our nation states. So when for example, we hear that the EU’s public consultation on TTIP, which came out fulsomely 97% against, was just ignored… you’d say that was far from the whole story? MK: It is the states that were ignoring that consultation. Remember that the European Union can’t be more than the states that make it up and we are one of those states! Water privatisation was another similar case. But the EU does have this emergent mechanism for the European Citizens Initiative and that is quite important. There is one other argument that I really want to make for the emancipatory aspect of the EU, and that is the globalisation argument. There is no way we are going to be more democratic outside the European Union. We are actually going to be more vulnerable to multinational corporations, to global finance than we are at present. And in a globalised world where many of the decisions that affect all our lives are taken in the headquarters of these multinational corporations, are taken on the computer screens of financial whizzes – the nation state just doesn’t have the power to reclaim democracy. That is a really important argument – that even if the European Union is at the moment going with the winds of global finance and multinationals, at least it is an institution which we can potentially use to restrain it. So if we really want to be serious about democracy in the sense that we want to be able to influence the decisions that affect our lives, we can only do it through something like the European Union – so that if it didn’t exist we would have to invent it! Alex Sakalis (AB): But where would one begin to increase democratic accountability – given the many barriers to the creation of the European Union as a bulwark against neoliberalism and globalisation, it doesn’t seem likely…? MK: No, at the moment it is the opposite. But the nation state on its own is also the opposite. And the fact is that every nation state on its own can’t do it alone. So the question is – how do we do it? The way we must do it is through creating pan-European social pressure of which DiEM25 is one example. I don’t think that the priority is to call for a constitutional convention. The most important thing at the moment is to push for a social Europe, and for a European security policy that really addresses conflicts in a serious way. Because, I think everything will follow from that. RB: What kind of impact do these issues have in the Brexit debate so far? MK: None. That’s what I think we need to concentrate on. What Yanis Varoufakis is doing with DiEM25 is great, because there needs to be much more pan-European pressure from social movements. But one of the big problems we have had up till now has been that the new movements on the left have tended, I think, to be quite nationalistic, rather than pan-European in orientation. But actually, what we learnt with Syriza was that national movements cannot achieve anything on a national basis. The only way you could manage to achieve anything is by doing it in a European way. RB: Do you think Podemos sees that? MK: Podemos has the same tension. There are civic activists in Spain to be looked to in this regard that are more progressive. Podemos is not the only element in play. Look at what Ada Colau is doing in Barcelona, with city networks, and hosting DiEM25. Wouldn’t it be wonderful if Sadiq Khan extended a similar invitation to London to mayors across Europe? RB: Wonderful idea. Do you think migration could be another opportunity for reinventing European solidarity? MK: Yes I do, and I think it is happening. There has been a fantastic outpouring of people’s help for refugees, whether it is in Greece or Calais, and bringing those people together could be incredibly important. Again, the border policy that the European Commission came up with for refugees was so much better than what the states came up with. It is the states that are deploying traditional nation state methods – to strengthen their borders. What does strengthening your borders do? It doesn’t mean that you solve the problem in any way. You just make it more dangerous and more miserable. AS: But we can’t ignore the deal between the EU and Turkey. Donald Tusk said no one has a right to criticise Turkey, which now has a very laudable approach to migration! Clearly, the good will of people has not percolated though to Donald Tusk and the Commission. So what has happened there and how can social movements address this? MK: No I agree. I’m not defending everything the European Union does, and I am not saying that social movements can have the necessary impact to reverse such developments anytime soon through pan-European pressure. But I am saying that this is our job. Our job is to try to put concerted pressure, not only on the European Commission, but on our governments who are the ones who make the decisions within the European Union. So it is our responsibility to be doing that. AS: Maybe we have to concede that there are such differences between the political and social cultures of western European states and post-communist European states, for example, that a pan-European migration policy is just not possible at the EU level? MK: That’s a really important question and you may be right. It is terribly sad what has happened in eastern Europe and I think part of the problem was that Eastern Europe became democratic at the precise moment that neoliberalism took hold, and that its effect on those countries was devastating. In countries that have been used to a fair degree of welfare and equality, even if they didn’t have democracy and were totalitarian, that totalitarian past where racism and tolerance were never discussed, plus the impact of the inequalities and the unemployment that were then suddenly introduced into these societies, ensured that a real tragedy is now happening in eastern Europe. RB: … whose hope is that there will be solidarity for them from across Europe. RB: So Mary – you said that a television debate last night had you rather exercised? Now, it is certainly true that in the initial stages of the Bosnian war, the EU made a mess of it. There were lots of options and they didn’t really know what they were doing. And it’s also true that it was important to bring in the United States. But despite the fact that people often say that it was Nato bombing that ended the Bosnian conflict, this is not really the case. It was because the various sides had reached the point where they needed the international community to legitimate what they had done. And if anybody from the outside had a salutary effect it was the British and the French who lifted the siege of Sarajevo under a UN mandate, not the American bombing. The Balkans is a terrible mess and I am not going to be uncritical of the European Union. But if you compare the Balkans with other post-conflict areas, there are huge problems, but it actually is calm. And it has been the combination of EU investment, the attraction of EU membership, the whole accession process, which is actually a very different kind of security policy, which has ensured that. Then the second thing that David Owen said was that it was the EU signing a deal with the Ukraine that had provoked the Russians to invade Crimea, which I find completely outrageous! I don’t want to defend anything the west has done. I think Nato expansion was a mistake. Putin is quite right when he says that it was illegal to invade Iraq and all of those things. But if you really want to know why the Russians did what they did, it was because they were afraid that the EU agreement would bring transparency to what the oligarchs were doing in Ukraine and their connections with the Russians. And that is just what was required on behalf of democracy in the Ukraine! So I thought that also was outrageous, that he was allowed to say that without anyone coming back to him. RB: Do you feel that the BBC are hampered by the Reithian concept of ‘balance’ when it comes to the EU referendum debate? MK: It was suggested to me today that if someone said “2 + 2 is 4” and someone else said “2+ 2 is 5” – the BBC would feel that they had to balance these two views! But I feel actually that the BBC is positively on the side of Brexit! To return to David Owen, I have no idea what he meant when he said that the EU was no good for our security, or indeed what the five former Nato Secretary-Generals meant when they said that it was good for our security. What I do think is that the EU represents a different model of security that is the only model that is really viable in our global interconnected world. There are lots of problems, but gosh it is miles better than what the Americans are doing, or what we do on a national level, with armies and defence policies that are totally counter-productive and very dangerous! RB: In your last article for openDemocracy on this, you described EU policy on Greece as a significant turning point, flagging up a real warning in the race to the bottom that is going on. You wrote that there has to be a major reversal of policy if Europe is to be saved. MK: This is the case. The most important thing that the EU must do at this stage is to hugely increase the EU budget, to redistribute funds, to forgive Greece’s debts, to have a Tobin tax, have a tax on safe havens, to put money into green investments – these are the things that the EU has to do if it is going to save itself. If it goes on putting this kind of pressure on Greece, on Spain – we can’t go on with these austerity policies for ever. There has to be a reversal. RB: Why do you think so few social democratic parties have even begun to espouse that agenda? MK: It’s very like the 1930’s! The social democrats discovered that by becoming neoliberal they could win elections. And they haven’t realised that times have changed. That’s what the row in the UK Labour Party is all about. I think it is the total failure of social democracy that actually is the problem. The EU method was always the idea of low politics. The idea of Monnet and all his followers was that somehow if you had economic cooperation, harmonisation of laws, student exchanges and all of these things, somehow Europe would filter upwards from these low politics. And it never did. Actually, security policy is a really good example. If you look at what the EU does on the ground in places like Bosnia, the Congo, Palestine – the EU is funding the entire Palestinian Authority! It is supplying community policing while everybody else is funding armed groups in one faction or another. But at a political level, the EU feels obliged to go along with what the Americans and others do, rather than actually supporting Palestine politically and explicitly. That is the problem: the EU has something like a human security, human rights approach at the low politics level, but this is not translated into human rights at the level of high politics. RB: To do that you would have to have a public that was more literate? MK: More than anything else you would have to have a European political class that was more literate! The debate that we are having on the European referendum is criticising and defending it at an Establishment level, but nobody is discussing where we want Europe to be in twenty years’ time. This despite the fact that nowadays more than 50% of young people in the UK go to university. Most of them are engaged in European exchanges, and the Easyjet generation move around Europe with ease. It comes down to the inflated importance of the nation state. In Northern Ireland and Scotland, for different reasons, they do better at ‘getting’ Europe. For Northern Ireland, being part of Europe was absolutely crucial for the peace process. The fact that both Ireland and Britain were part of Europe meant that being Irish or British was somehow less important. In the UK at this particular moment in time why is there such an old-fashioned argument about Britishness, which seems to bear very little relationship to people’s lives? I see it very much in the Defence debate as well. Why are we having this debate about Trident – it’s kind of ridiculous? – when actually the big questions are around conflict, migration. AS: You say many British people don’t get the EU, but in the EU you want them to get, in Austria they have only just escaped electing a far right president who is virulently anti-EU, and on the continent of Europe, in Hungary, in Poland, there are many flourishing far right parties. What is to stop them getting that EU? Mary Kaldor: If we just say, oh to hell with this, there’s fascism on the continent… there will just be more fascism on the continent. What we need is an EU that really addresses the problems that people face. It may sound like vulgar Marxism, but from the 1930’s we know that unemployment produces fascism. The EU has the capacity to solve those problems. I agree it is not solving them. All I am saying is that without the EU, we will have no mechanism to solve these problems. That is the point. AS: 15 years ago, the Freedom Party of Austria won the elections with Jorg Haider in a coalition government. The EU’s response at that time was to say, “ No you can’t have fascism in a European government: we are putting a cordon sanitaire around Austria!” Today they don’t do anything to combat Orban, the rise of similar in Poland, they do deals with Turkey… so aren’t we going in the opposite direction from what you want to see ? Mary Kaldor: Yes – and we see it here in the UK. Look at this last mayoral election? It was unbelievable to me that you would have Zac Goldsmith attacking Sadiq Khan for being a Muslim and the Labour party attacked for being anti-Semitic. That kind of really nasty politics, which includes the toleration of fascism is growing everywhere. Why is it growing? In my opinion, it is because national politicians of every hue are unable to introduce programmes that would actually make things better for ordinary people, and so instead, they are appealing to their deepest prejudices. Until you have serious programmes that do actually address those problems of ordinary people, things are going to get worse. The EU is not adopting a moral high ground at this point because the EU is made up of horrible conservative governments like the British Government, Hollande who is hopeless – there are compromises, but the EU cannot be better than the states that make it up. Fifteen years ago we wrote about oil states suffering from the resource curse which meant that they got so much money from their oil that they didn’t need to satisfy their citizens, they just needed to win elections in order to get access to the oil money. We called that the ‘resource curse’. What I think has happened is that after 2008, basically by saving the banks and flooding the world with money, the ratio of finance to manufacturing has completely changed. Governments are increasingly dependent on finance: which then means that everywhere is becoming like an oil state, and all they care about is getting access to government. They don’t care what kind of methods they use. None of them, apart from some of the new insurgent parties, are competing to get into government to carry out alternative social programmes. But the only way capitalism is going to survive, if we want it to survive, will be through investment in a green economy. This is an economic argument. Business is being very shortsighted. They don’t understand that we could have another phase of growth if we really invested in energy efficiency and alternative energy. On security, the old methods simply don’t work – none of the old methods work. Bombing doesn’t reduce the number of terrorists: it produces more. Unless we have an alternative security approach we are not going to solve any of the problems either. So their arguments that the EU is good – or bad – for business or for security are really based on the same old-fashioned assumptions on what business or security is, and we need to change those assumptions. Capitalism can’t survive without state intervention – that’s my view. We can’t recover without it. But not state intervention on a nation by nation basis. We need state intervention on a European and global level. And not any kind of state intervention, but state intervention directed at resource-saving.